Ladder stitch is frequently used in beading as a base for other beadwork stitches such as herringbone (also called ndebele) and brick stitch or for a flexible base that can be embellished. But as this picture shows, it makes some very pretty projects when used by itself. 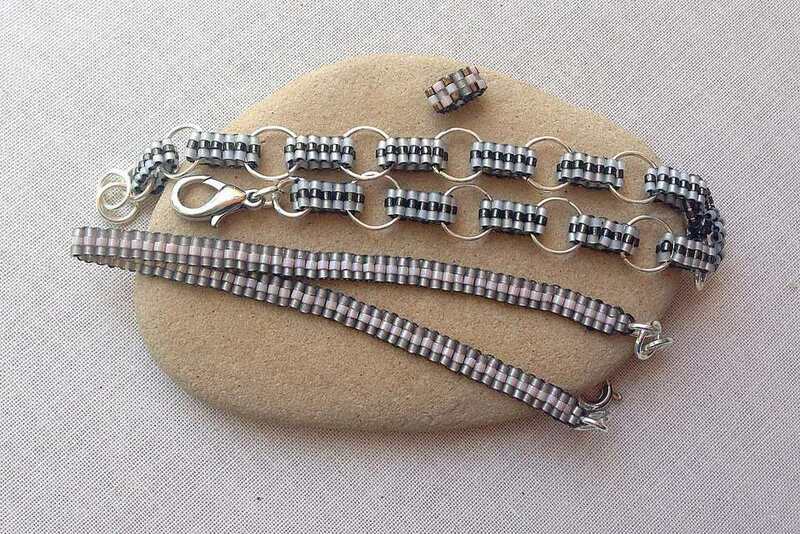 This step by step will show you how to make a ladder stitch band and use it to make bead links for a chain, to make a ladder stitch bracelet or turned into small beads that can be used as spacers. To start your ladder stitch, thread enough beads for your first and second rows. I am making a ladder stitch chain that is three beads high - so my first row will have six beads. Because ladder stitch is laid out in evenly aligned rows and columns, you can plan your pattern using regular graph paper. Stitch back through the first row of beads and align the beads into two rows. Pull thread tight. I am using 6 lb Fireline bead thread in Smoke color with 11/0 delica beads. Any bead thread that does not stretch would work well for ladder stitch. I like Fireline because it is relatively stiff. Using ladder stitch to make chain links works very well with delicas or other Japanese cylinder beads because of their uniformity in size and shape. Stitch through the other three beads. At this point, the beads will stiffen slightly and align more into two rows. As you add each row, the previous row will straighten out and become better aligned. Pick up three more beads and back stitch through the previous row of beads. Pull the thread tight so the beads stay pushed close next to each other. Stitch through the three beads you just added to complete the stitch. Continue in this manner until the beadwork strip is long enough for whatever you are making. To make a circular ladder stitch link, I like to use a strip of ladder stitch that is 12 rows long, or about 3/4 of an inch long. The resulting link will be about half that size.- in my case about 3/8 inch long. Join the two ends of the strip of ladder stitch beadwork together by inserting your needle into the first row of beadwork - where the thread tail is coming out of. Pull the two ends of the beadwork together to form a tube. Then stitch back though the last row. Complete the stitch by going through the bead with the thread tail one more time. When you pull the stitch through, the tail and working thread will be on opposite sides of the beadwork. You will have good leverage to pull on each thread and tighten the two sides of the bead link. Once you have the tube ends closely aligned, stitch back through the other side of the link. Your working thread will coming out of a bead next to where the thread tail is. Complete the tube link by knotting the two thread ends together using a square knot. I like to add a drop of crazy glue before I weave in the thread ends and snip them. To weave the thread ends in, I zig zag back through the previous stitches and end by doing more ladder stitches. Be careful not to pull through beads too tightly or they can break. When you are done, you have made one link. You can make more links and connect them with jump rings or chain or incorporate them into other designs. Use the tapered end of a pen or pencil to open up the link and make it round. In this shape, it works well as a spacer bead next to other round beads. If you have beads that will fit, you can put one or more heishi beads inside the spacer tube to help it maintain the shape and keep from flattening. Connect the ladder stitch links with jump rings or other beads to make a bracelet like you see in the picture.